The Pulsar Apex XD75 is the latest thermal rifle scope from Pulsar, with 384 x 288 pixel resolution microbolometer and 640 x 480 pixel resolution OLED eye display, the unit offers the greatest magnification in the Pulsar thermal range to date with its F75/1.4 germanium lens and fast 50hz refresh rate for lag free viewing. The unit is powered by two CR123A 3V batteries, but it can also be powered by the lower capacity but higher voltage RCR123 rechargeable batteries instead of disposable offerings, it has a dual purpose multi pin connector socket on the underside of the unit which provides a power in socket and video out in a single lead, with this lead a Pulsar EPS3 battery pack can be utilised to extend usage time considerably. 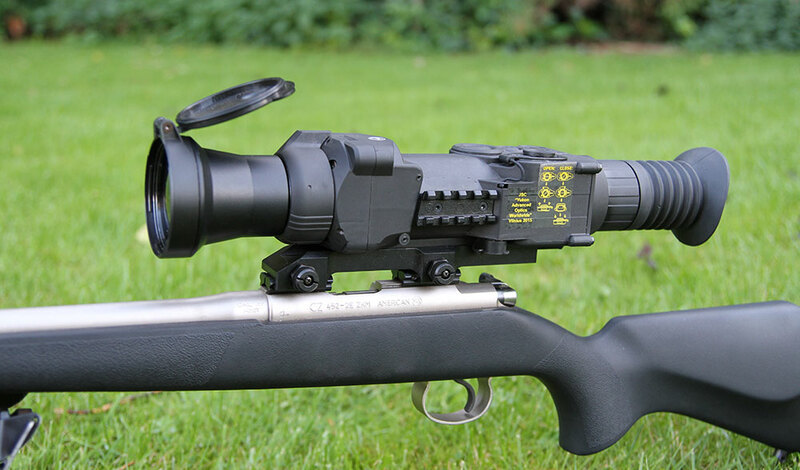 Compared to other dedicated scope units the Apex is a lightweight at under 0.8kg in weight without batteries, making it very useable when rifle mounted, it can be fitted to a rifle action using the supplied weaver mount or a dovetail mount can be purchased separately if required, the unit mounts far back on nearly all scopes for perfect eye relief and is rated up to 6000 joules, so it is ideal for even the largest calibre rifles and recoil. The unit is IPX7 rated which means it is waterproof and can withstand even heavy showers and the most extreme of weather without damage to the unit including short periods of submersion. The lens fitted to the Apex XD75 is a F75/1.4 lens and offers a 3x optical and 6x digital magnification, with man sized detection of 1600 metres, the Apex also includes a PIP function which stands for “Picture in Picture” and allows the user to view through the eye piece at native 3x optical magnification but also have a 6x magnification image above the standard viewing display which allows for more precision when shooting at longer ranges. The unit can be used as standard without the PIP function and digital zoom can be utilised if required to with smooth increments upto 6x magnification. When accessing the menu function the Apex internal memory contains 10 reticles of various shapes and applications. A reticle is electronically displayed on the screen and is permanently located in the plane of the target image. The colour of the reticle can be switched from black to white also depending if the Apex is set to black or white hot. Similar with the latest Pulsar offerings the Apex can hold three sets of zero ranges and reticules which means you could swap the unit between rifles that are fitted with repeatable mounting options like a weaver/picatinny system or hold three zero ranges for different target ranges. The Apex offers three operating modes, each designed to deliver the best possible image in specific viewing conditions: “Rocks” (enhanced contrast), “Forest” (low contrast) and “Identification” (improved rendering of hot objects’ details), these settings adjust the contrast and brightness to pre defined settings, these can also be manually adjusted with the side rotary switch in increments. Standard for Pulsar digital riflescopes “one shot zeroing” in Apex models is complemented by an even more convenient zeroing function – “Freeze”: after making a zeroing shot it is enough to save a frame of a target in the memory of the riflescope and align reticle with point of impact looking at this frame without the necessity of keeping full immobility of a weapon. The Apex has a display shut down function which can be used to prevent disclosure of the shooter by the light from the eyepiece. When the display is turned off all other systems are fully functional which allows instantaneous activation of the riflescope. This is very useful when carrying the rifle on foot to prevent light from being emitted and alerting quarry and prevents the user having to fully power down the unit. When testing the unit against a Pulsar HD38S handheld monocular as a side on comparison the image quality and detection range of the XD75 is greatly improved due to the larger objective lens. The Apex XD75 is great for rabbit shooting it makes an unbeatable setup at night when combined with the a flat shooting HMR, no rabbits are safe hiding in hedges, scrub or long grass, the slightest glimmer or radiant heat gives there position away, not only do you get rapid target acquisition, you also gain a wide field of view with terrain and quarry all clearly visible, night vision does not give the same result and 9/10 times requires additional IR light with an add on torch or laser which bulks and adds weight to a unit, the number of times I’ve looked through a handheld thermal device and swapped to a night vision scope to take a shot and taken awhile to get on target or find the quarry, this just isn’t a problem with a thermal scope. 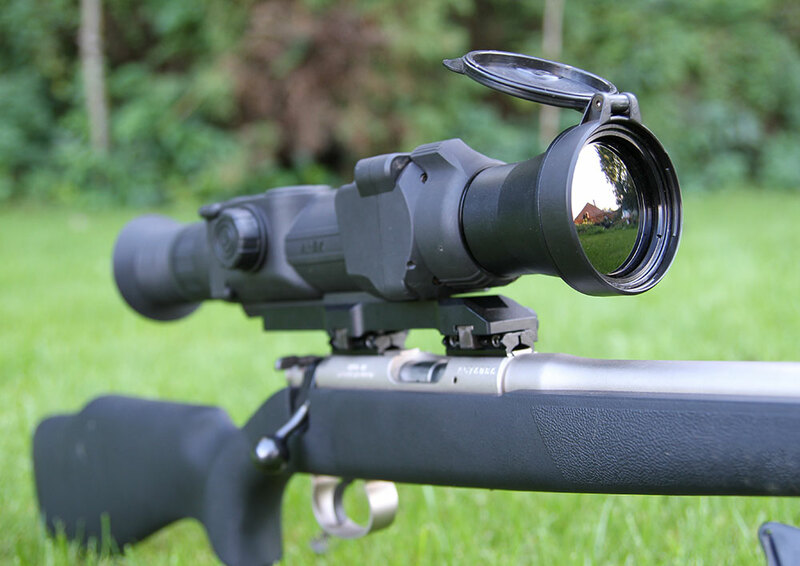 For fox shooting the Apex is also great with its 6x magnification and PIP mode it allows shots to be taken out to 200-250yds, its image detection range is in excess of 600 yds for easily picking up fox size targets. Control functions accessed from the top of the XD75, On/Off , Calibrate, PIP and colour mode selection. The Apex does have some negatives and that is the cost at £3799.99 its not cheap and out of the normal shooters price range, but given a few years ago you would of paid in excess of £10,000 for similar specification scopes it offers great value for money, another slight gripe is there is only one accessory jack on the unit and this is a combined power in and video out connection, its a multi pin single lead that splits of into two leads and is connected underneath the unit, personally I don’t like the design of it and I’d of much preferred two separate sockets, to remove the need for the splitter cable, and snagging risk when using it. The unit can be run from standard CR123A 3v batteries or the pulsar EPS3 battery pack can be attached to the side and connected for extended run time. A big benefit of the Apex is the fact it can take a wide voltage range to supply power to the unit and can run on the higher voltage RCR123A batteries that supply 3.6v and upwards when freshly charged without issue, this enables the unit to stay compact without using a lot of CR123 batteries or additional power packs for people who like to keep things light and simple. I’d recommend the Nitecore Brand of batteries as some other rechargeable RCR123 batteries and longer and will not fit. Overall I would highly recommend the Apex XD75 thermal scope for rabbit or fox control at night, even for ratting it is a total game changer, it’s a different experience all together when compared to normal night vision scopes, little is missed and quarry stands out like a beacon. I’ve used some decent night vision equipment and to be honest, I’ve always went for the Apex since it landed in my hands, it’s deadly. Some video footage of rabbit shooting at night with Apex XD75 and HMR rifle on various terrain at distances upto 150 yards, the recorded footage has lost some quality due to compression and editing. Amazing F75/1.4 Germanium lens offers excellent image clarity and detection range. Lightweight design adds minimal weight onto the rifle. Excellent eye relief compared to some night vision scopes which require really long rear mounts. PIP function allows for precision shooting whilst also giving full range of view in the same image. Multiple reticules built in and split colours. White hot for instant detection and Black hot for greater image clarity. Ability to use higher voltage rechargeable RCR123A batteries. Three zero memory for fitting to different rifles with weaver/picatinny mounts. Rapid target acquisition for quick shots in succession, with a very large field of view. No additional IR torch required so no visible light emitted, 100% covert. Price is high, but compared to a couple of years ago its a bargain, but still limiting. Video out and Power in socket, works fine but is not the best design, it points out at an obscure angle, separate sockets would have been much neater and cause less problems..
Target detection at excessive ranges is easy out to 800yds or more, but target identification of smaller animals like rabbits and foxes I would limit to under 150 yards for rabbits and 250 yards for fox to ensure 100% positive identification. The Pulsar Apex XD75 offers value for money in comparison to prices only a few year ago that would of seen the price tag three times higher, in terms of competition there is nothing in this price range that offers the same level of performance. In the field the Apex is a real eye opener and will help to increase your tally when shooting compared to using standard night vision without any doubt. I'd highly recommend one for pest control to anyone.